If you would like to have a bathroom remodel completed at your home, make sure you partner with a business you can trust. 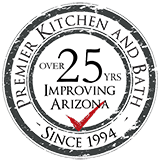 Premier Kitchen & Bath, a remodeling company serving homeowners in Tempe, Arizona, and surrounding cities, is a business that you can feel confident in. Founded in 1994, our company has decades of experience in the home remodeling industry. We are committed to our customers’ complete satisfaction, which is part of the reason we maintain an A+ rating with the Better Business Bureau and have been recognized as a Top 500 remodeling company by Qualified Remodeler. Premier Kitchen & Bath is proud to be a full-service, design-build contractor. This means we can take a bathroom remodel from concept to completion – all under one roof – so our customers don’t have to travel all around the Tempe, AZ, area to coordinate with multiple professionals. Instead, our customers enjoy the convenience of having one point of contact for the duration of their respective remodeling projects. Our designers will meet with you to learn about the requirements and desires you have for your bathroom remodel. After the initial meeting, our designers will visit your home at a convenient time to measure, sketch, and take photographs of your space. Multiple design concepts, complete with 3D renderings and product samples, will be developed just for you and shared with you by our designers. Revision meetings will be scheduled as necessary, during which our designers will customize your preferred design until you are completely satisfied. Our team of carpenters will meticulously build out your bathroom remodel to the highest standards in workmanship. Having a bathroom remodel completed is a surefire way to breathe new life into your home. 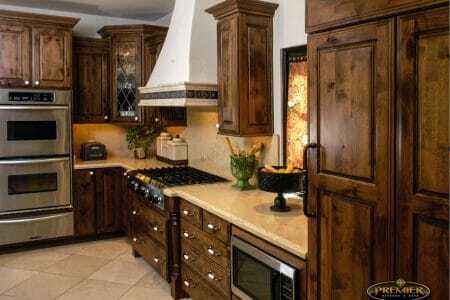 Contact Premier Kitchen & Bath today for more information about the remodeling services offered by our company. We are proud to serve homeowners in Tempe, AZ, and the surrounding communities.